Clinique BIY Blend it Yourself Pigment Drops are one of the newest things from Clinique and I’m about them. Clinique used to, years ago, be kind of a ‘mum’ brand and didn’t seem to have the most up to date product ideas or launched. Well, now they’re killing the game. Not only have they released their amazing Fresh Pressed vitamin c powder skincare which not only actually works but works really well. 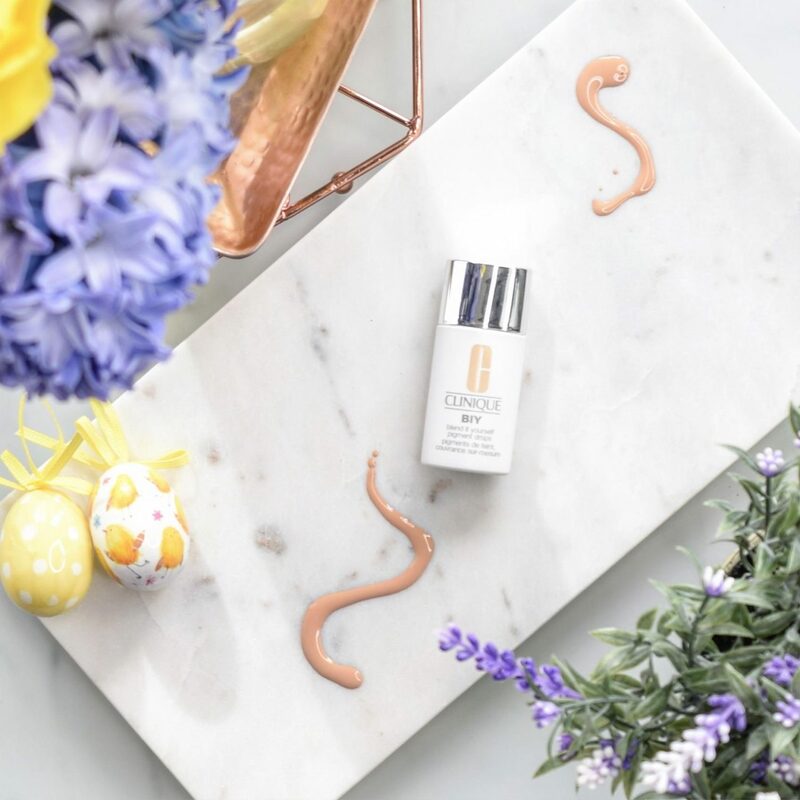 Now they have this new take on a foundation which is perfect to give you choices in how your foundation applies, looks and means you don’t have to buy an entire ‘wardrobe’ of different types of foundation. BIY Pigment Drops – Er What? Transform your favourite moisturiser into a BB, CC or fuller-coverage foundation. One drop of Clinique BIY Blend It Yourself Pigment Drops creates a sheer cover. Two or three, a flawless finish. Since Clinique BIY takes on the finish of the product you blend it with, expect a more matte finish with a mattifying moisturiser. What you get is a relatively small bottle, which something inside which rattles when it shakes, presumably to mix up the pigment. The pigment itself is like concentrated foundation so once you’ve picked your shade, you’re sorted. This makes putting on your foundation each morning so easy. All you do is look in the mirror, see what coverage you need that day and proceed accordingly. No need to rummage through 20 foundations or, if you only have 1 foundation, have to apply it even though it doesn’t look good that day because you have no alternative. One BIY pigment drops can last you ages and also help you use up other products you’ve kept but never use as they don’t work or aren’t the right colour. So it’s easy, handy AND money saving. I can’t say enough good things about this. 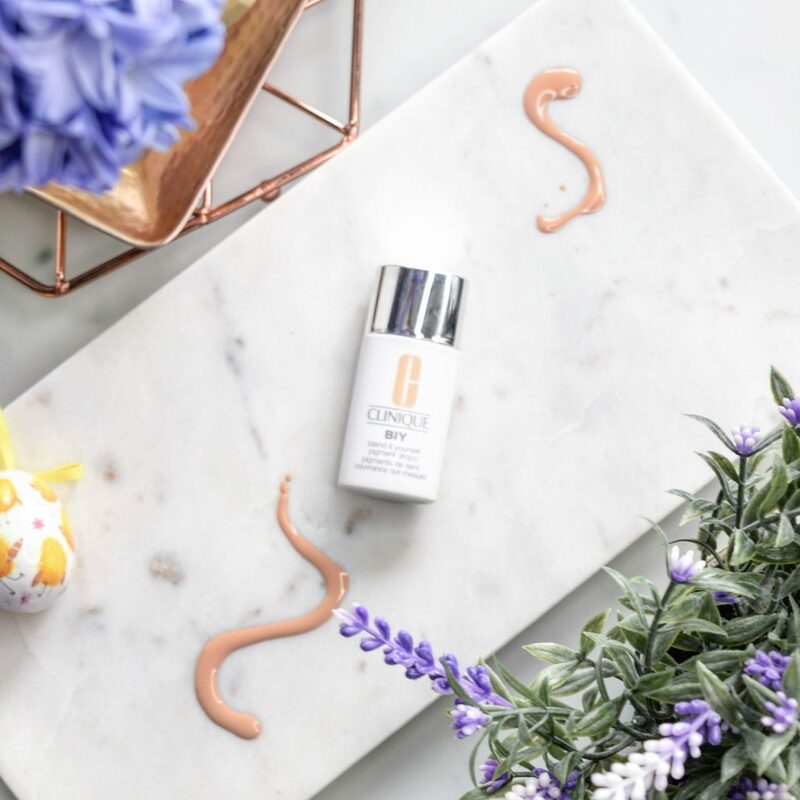 You can even customise the coverage you use on different parts of your face, for example: mix up moisturiser and 2 drops of BIY and apply to your face, but then say you have cheek acne scars, you could then add another drop and use that one the cheeks for exactle the same finish and colour, but more coverage. It’s actually amazing! I like this product much more than CoverFX Custom Cover drops, which I didn’t even blog about as I just didn’t get on with them and gave it away. I love that the bottle is small and light which is perfect for travel. I’ve tested this out for I think over a month. Which I think is a good amount of time to be able to review it properly. Personally, I like wearing sheer to medium coverage foundations and this Clinique BIY works like a dream for me. For reference, I am naturally pale but wear fake tan. I have very sensitive skin, the focus for me is on anti ageing and my skin is dry and dehydrated no matter how much water I bathe my liver in. The Clinique BIY Pigment Drops retail for £25.00 here at Boots and they have 13 shades in the range.